The theme for this month's Reverse Confetti Stock Your Stash challenge is wedding. 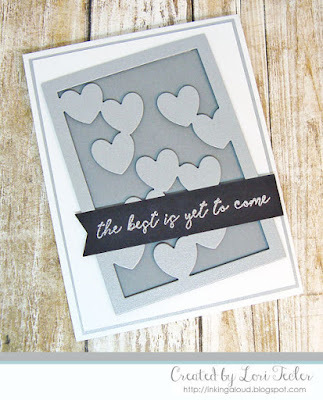 I combined a few different RC products for this simple design that doesn't specifically say "wedding," but would make a lovely card to celebrate a new marriage. I've had the Falling Hearts Panel in my collection for a while, but I don't think I've used it before putting together this card! Here, I cut it from silver cardstock and put foam tape on the back, then adhered it to a gray cardstock panel. The backed die cut panel was adhered on an angle to a plain white cardstock panel. After matting the panel on silver cardstock, I adhered it to a white card base. For the sentiment, I did a bit of creative die cutting to cut an extended banner strip with a die from the Tag Me die set. The "best is yet to come" sentiment from the Mod Floral Stack stamp set was stamped on the strip in silver ink, then heat embossed in silver. I adhered it over the die cut panel to complete the design.